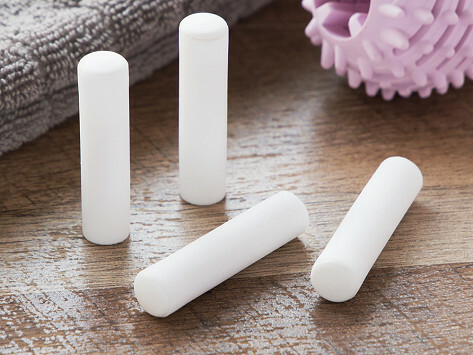 Fill up your dryer Ecoegg with these hypoallergenic, fragrance-infused sticks. They’re good for 40 great-smelling loads. Dimensions: 4" x 2" x 7"
The dryer eggs work very well. Not only is my drying time shorter, but the clothes have a great smell when done. Smells great. Love to save money. Not much to report... it’s a refill. This refill smells wonderful and it does not overpower the clothes. When we first heard about Ecoegg’s all-natural, long-lasting laundry detergent alternative and dryer eggs, they sounded almost too good to be true. When you do the wash, you don’t need to use pods or liquid detergent. Toss Ecoegg’s washer egg in with your load and the pellets inside do the cleaning and stain fighting. Ceramic pellets weaken the bonds between dirt and fabric, while mineral ones ionize the oxygen in the water, lifting grime without damaging fibers. Each laundry egg comes with enough refillable pellets for 210 or 720 washes. Whether it’s just you or you’re washing for the whole family, one egg could last for up to three years. 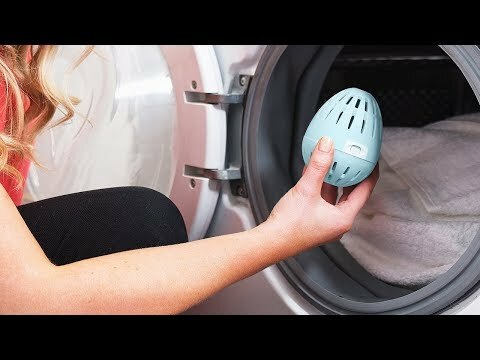 Ecoegg makes hypoallergenic dryer eggs, too. They’re dermatologically tested for sensitive skin. Fragrance sticks infuse your clothes with a fresh scent and the nodules on the egg’s surface soften fabric and reduce drying time by almost a third. Enjoy a more wallet- and environment-friendly way of doing your laundry.